concentrations such as urban design and public health. The posters varied further with topics ranging from the Tijuana River Valley Regional Park to the revitalization of alleys, and were the summation of approximately thirty students’ Senior Thesis Capstone Projects. The Urban Expo is a unique event on UC San Diego’s campus, and its significance cannot be understated. I initially came to UC San Diego as a Psychology major and subsequently switched and mulled over a variety of majors before landing in the Urban Studies and Planning (USP) Program. I had taken a lower division USP class by chance, and what immediately spoke to me was the program’s high expectations of its students. When I attended the 26th Annual Urban Expo two years ago, I was simultaneously shocked and inspired by the amount of work that went into the projects that the students had produced. While I cannot speak for other schools, I do know that the Urban Expo is a uniquely special event for UC San Diego. Having such an extensive capstone project, let alone a large-scale exhibition to showcase the work that its students and community partners have done, is unique to this program, and I know I am a better student because of it. While it served as a showcase of the USP Program’s students and their ability to tackle pertinent planning problems, the Urban Expo also served as a community gathering space. Students, faculty, and staff from all departments intermingled with friends, family, and San Diego community members. It was only fitting that the event had representatives and exhibitions from community partners such as the Preuss School, the San Diego Section of APA, the SANDAG Regional Planning Technical Working Group (planning directors from throughout the region), and many more, as the USP Program has always instilled the mindset within its students that the work they’re doing has the potential to make waves in their very own communities. 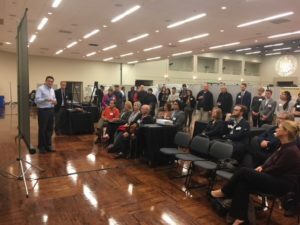 Though the Urban Expo kicked off with an open house at 1:00pm, most of the students whose work was being exhibited at the Expo started trickling in at 4:00pm, when the SANDAG working group presented lightning talks on the Mid-Coast Corridor Transit Project. Following their presentation, members of the working group were given two students’ names and were asked to listen to short research presentations given by said students. There’s writing a research paper, and then there’s presenting your research. These are two seemingly related tasks, but these tasks demonstrate two vastly different skill sets. Though presenting to someone, such as a Planning Director, may seem like an insignificant activity, I know that many of the students—myself included—were excited to be able to present their research to people not only working, but excelling, in the planning profession. This, in addition to presenting to fellow students and San Diego community members, allowed us to summarize our projects out loud to another person, as opposed to our computer screens. The night transitioned to a keynote address by UC San Diego’s very own Gary C. Matthews, Vice Chancellor for Resource Management and Planning, and the night concluded with the awards. 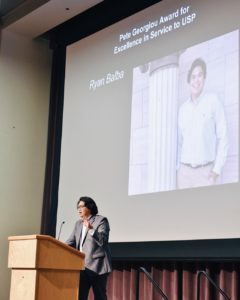 This portion of the night was particularly momentous for me, as I had won an entirely new award, the Pete Georgiou Excellence in Service to Urban Studies & Planning Award, and I was given the special privilege of being the final student speech. To be able to present my research, get interviewed by a journalist, and be recognized by my mentors and peers all in one night at one event is remarkable, and I left the Urban Expo feeling incredibly prepared to graduate and enter the professional world of planning. The Urban Expo was many things for many people. For some students, the exhibition was yet another milestone in their planning journey. 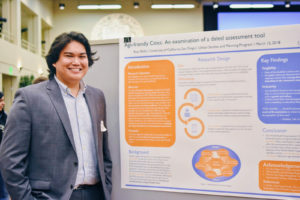 For others, it served as a token of their hard work these past two quarters, which includes, but is not limited to, the long nights spent researching and the 100 hours minimum spent in an internship. For myself, the event functioned as all of these things, as well a space for professional development, reflection, and community engagement. While the 28th Annual Urban Expo signaled the end for the graduating cohort of students in the USP Program, it moreover signaled the beginning of our professional lives.